Shedding in the home can make quite a mess! Many high-quality cat foods are on the market. And some are specifically formulated for hairball reduction and a smooth and glossy coat. For example, Wellness Cat Food contains olive oil and flaxseed to aid in a healthy coat. Other cat foods may have avocado oil or other types of oils. Another ingredient is extra fiber to help hair move through the digestive tract. Also, make sure you are aware of the cat food ingredients to avoid when choosing a new cat food. 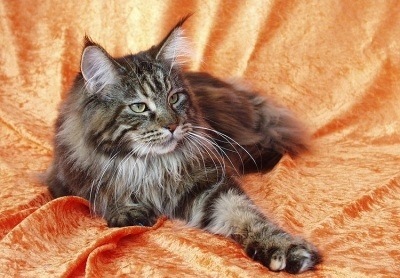 A good hairball control cat food is the first step to a beautiful coat for your beautiful cat! We have a whole page about hairball remedies to reduce hairballs, and keep his coat lovely. Some home remedies for hairballs include canned pumpkin, fish oil, and even petroleum jelly. Alternatively, there are hairball lubricants available right at your local pet store. They will have instructions and dosage recommendations right on the package. Now it's really grooming time! Before you can brush your cat you'll have to remove any mats that have developed. You don't want to pull his skin (then he'll just hate grooming time all the more!) But this is not as easy as it sounds! First, find a helper. Your helper can pet, stroke, scratch and use whatever means necessary to make the cat happy. 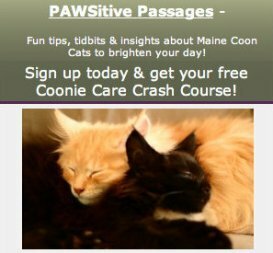 Their main goal is only to keep your cat as happy as possible for as long as possible. Get a fine-toothed comb and place it between the skin and the mat, and use scissors to snip off the mat. Get through it as quickly as you can, before he decides to make a run for it. You can even do this in a small room, so he has nowhere to go. When he's had too much (i.e. he's hissing, growling and trying to run for dear life) you should take a break. Come back to him when he's happy again. If the mat is small and not too tight, you may be able to comb it away. Start at the ends, and use a comb not a brush. Make sure to hold the skin firmly so it doesn't get pulled. If the mats are just too much, consider a lion cut. A professional groomer will shave your cat, leaving the head, feet, and tail. It's a good choice in some cases. Many cats seem to strut their stuff when they sport a lion cut! How to Groom A Cat - Bathe Your Cat! An important step in how to groom a cat is bath time. 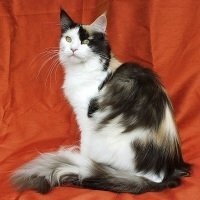 A longhaired cat can get dingy and smelly without it. There is just so much fur for him to keep up with! He needs all the help he can get. We have a whole page on how to bathe a cat, complete with our method and our secret tool. This is an easy one to overlook. Cats need to sharpen their claws in order to stretch and keep their muscle tone. Ever notice a cat stretch, yawn, and then prick the rug a bit? There's no stopping it, so that's why we clip their nails! It's not hard at all. Start with some guillotine style clippers. Then, holding your cat comfortably and securely on your lap, squeeze around the nail a bit. You'll get the nail to come right out. When it does, you'll be able to see the flesh, or "quick" inside. (If your cat is light in color, that is.) Just snip off a bit and you're done! You'll be a pro in no time. 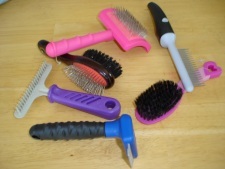 The purple-handled one is an undercoat rake, and it works pretty well. Most of them do what they are supposed to do. It takes a while to get the job done, though. Our latest find is the FURminator deShedding Tool. That's the blue and black one in front. I'm so impressed with it that we'll soon be adding a whole page with our review. Stay tuned! The time has come, you've got your brush, and your ready to roll. Make sure your cats fur is dry. Also make sure he has no sores on his skin. His fur can hide them. If your cat is happily snoozing by the fire, or on his favorite chair or on your lap you are ready. Position yourself near him and begin with soft, long strokes down his back. Don't go repeatedly on the same area too much, as this can irritate the skin. Also be careful not to press down into the skin too much. The brush should do its job without that. Keep going until you feel you've gotten a good bit of fur, or until your cats decides this session is over! You won't be able to go after the belly, "armpits" or behind until he's comfortable with brushing time. Try to work those spots in slowly. Bribery is totally acceptable! Once your cat decides he's had enough, crack out his very favorite treats. Consider it a reward for a job well done, even if you feel like you've barely begun! See if you can get some more brushing in while he enjoys his treats. He'll start to associate the grooming and brushing with a yummy snack, and be more cooperative each time. Eventually, he should quite enjoy a nice brush-down. One of the most important aspects of how to groom a cat is consistency. Pick a time, such as during your favorite weekly television show, and make it part of your pet care routine. Hopefully he'll grow to love it, as many cats do, and it will become a special time for the both of you!